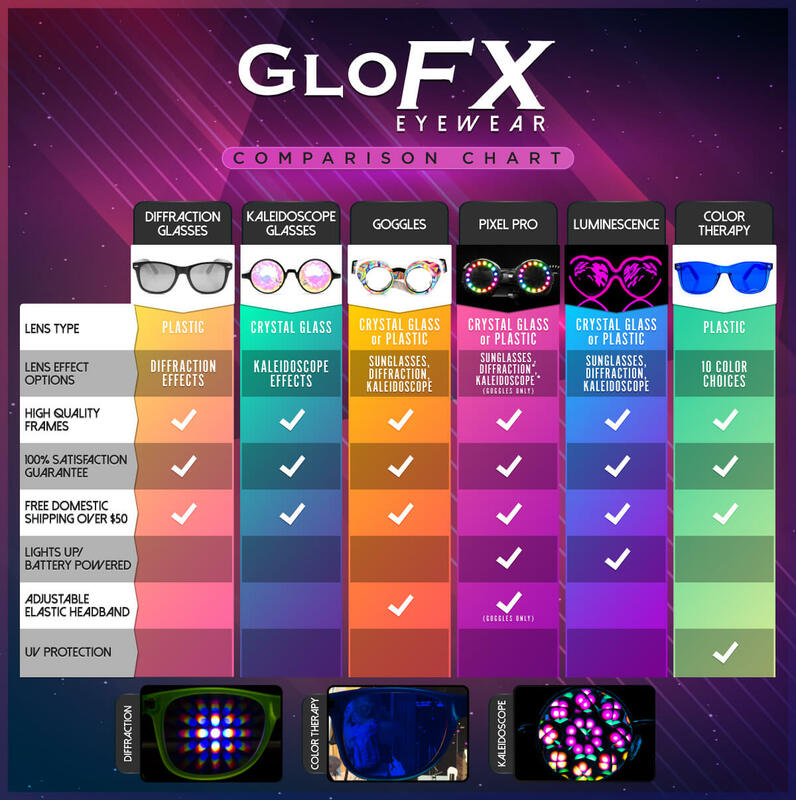 Since the conception of GloFX, our goal has been to innovate and engineer the future of rave eyewear. With our Ultimate Kaleidoscope Glasses, we’ve created something truly special. For supreme comfort and style we have taken our famous kaleidoscope lenses, and combined them with our classic “Ultimate” frame to provide you a set of Kaleidoscope Glasses unlike anything else on the market. The Bug Eye lens is an all new design available exclusively at GloFX. This lens allows for the light to be split into multiple angles or a traditional image, depending on the angle in which you view them. Never before has their been such a vast variety of imagery from one set of glasses. Our redesigned glass crystals utilize our Rainbow Spectrum Technology (RST), to create a different array of colors at every angle. The Bug Eye crystal allows for more clarity while maintaining an intense kaleidoscopic effect and deep pallet of colors. RST paired with our real glass Bug Eye crystal helps refract light from different directions. We developed our crystals with RST to provide the revolution in fractal kaleidoscopic eyewear. For years, Kaleidoscope Glasses have been limited to a perfectly circular lens and frame. We have created a lens that works with our best housing, the Ultimate True-Flex PVC Frame. The user can now see a wider view of rich prismatic colors with our most popular frame style. 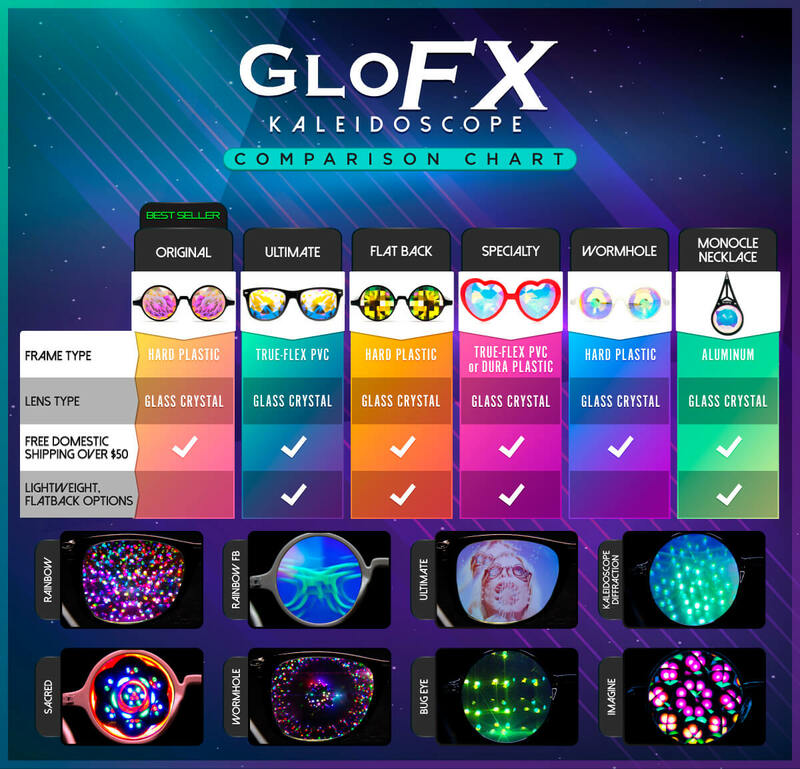 We’ve engineered the Ultimate Kaleidoscope Glasses for any fractal glasses connoisseur. Very please with this purchase. Overall, very solid pair of glasses. -Wish the effect was a bit more intense. If you hold still, you can almost see clearly through them. Way too heavy, The bugeye effect is quite trippy tho.